It is helpful to think of white stains as "white stuff" and undefined until some testing takes place. That will keep you from buying products and spending time on an incorrect diagnosis. Is the white stuff on top of a sealer or below it? Hint: If it comes off on your finger, it is on top. Did the white stuff exist before a sealer was applied? Do not seal again until the source is removed. If below the sealer, the sealer will need to be removed to treat it. An easy way to tell if the "white stuff" is mineral deposits or efflorescence is the "acid test". 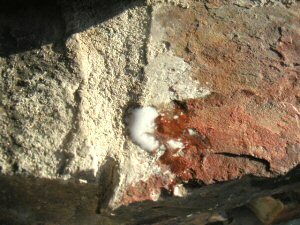 If the white stuff "fizzes" on contact with a drop of Aldon "Grout Residue Remover" or muriatic acid (swimming pool acid), than it can be mineral deposits (see below) or efflorescence (see its page in Problem Solving) and cleaned accordingly. Do not use muriatic acid to clean or you could cause some damage. Tip about sealed surfaces: typically efflorescence would be below the sealer (not in it) because it comes up from inside. Mineral deposits would be on top of the sealer as residue of drying water. If on top, it will wipe off. If below the surface, the sealer needs to be removed to access the white stuff for treatment unless Efflorescence Treatment is able to penetrate through the sealer. If you do see the fizzing reaction, see "Problem Solving" for "Efflorescence" and for "Mineral Deposits". The lack of a fizzing reaction says it is something else entirely, or the minerals involved in this type of situation are not the usual type that do fizz, or something is coating the white stuff and keeping the acid from contacting it. Therefore, mineral deposits and/or efflorescence are not ruled out - but the cleaning might involve other cleaning techniques. Try lacquer thinner , abrasion with a cleanser, sanding. The lack of a fizzing reaction can also mean that the white stuff is a coating that is breaking down (a sealer or top coating sealer protector). This does not happen with Aldon products if they are applied per the product label directions. You might not know that a sealer was present. Sometimes installers use a sealer to keep grout from sticking to the face of the surfacing. If you think it is a top coating type product (usually a water based acrylic), it should remove with Aldon "Insta-Clean" without hurting the underlying sealer, assuming the underlying sealer is an Aldon product. If the underlying sealer is not an Aldon sealer, be cautious and test first. You can also try "an ammoniated wax stripper for resilient tile" from the supermarket as these are too weak to effect a good sealer, but strong enough to remove a breaking down top coating. Soap scum - Aldon "Grout Restoration" will remove soap scum, mineral deposits, mold, rust, etc. This can be hard water mineral deposits from your rinse water. To find out, take a little of the same water from the exact same source tap as used on the project. Let 1/8" evaporate from a glass until dry. The minerals will be left behind in the same way they were left on your floor. Remove mineral deposits as discussed above (you can also use Aldon "Grout Residue Remove" if you already have it), but you need to do something about the rinse water. If it is not practical to use non-mineral containing water - test cleaning very small areas that you can immediately wipe dry. Note that even softened or treated water can contain minerals. Test an area with "Grout Residue Remover". If the deposits are gone, then it is only surface mineral deposits. If they remain, then they may be inside or below the sealer. Use Aldon "Premium Stripper" to remove a test section of sealer. Try to determine where the white stains are in this process. If they disappear before you get to the tile surface, then something was trapped inside the sealer. If the white is left on the surface after the sealer is removed, it is obviously coming from beneath the surface and was trapped below the sealer. To confirm, apply some "Grout Residue Remover" to the remaining white staining. If it "fizzes" and is eaten away, it is efflorescence. It could be a non-Aldon sealer peeling. See "FAQ Sealers".